Get your kids’ creative gears into motion with ThinkFun’s Maker Studio Construction Sets. With these construction sets, you can inspire their imagination and get them to develop an interest and love for engineering. Currently, there are three sets available: the Gears Set, the Propellers Set, and the Winches Set. Each set costs about $20. 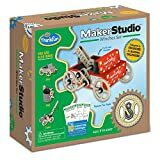 If you want your child to be interested in building or engineering, you will definitely want to give them any of the construction sets in the Makers Studio line as a present. Even teachers and those in the academe are looking for educational toys, and the Construction Sets are a perfect fit. Of course, the great thing is that these construction sets are not really limited to kids alone, because even adults who are belatedly discovering a love for engineering and building will also enjoy tinkering around with these construction sets. Some construction sets are pretty straightforward: they give you the tools, tell you what to make, and that’s it. Once you’re done, there is nothing left to do. The ThinkFun Maker Studio Construction Sets are slightly different. While building, there are Engineering Challenges that you have to complete. For example, in the Gears Set, the Challenges include conducting experiments with friction, propulsion and torque. So you are learning about scientific concepts as well! Each set, which has 4 builds, comes with 10 of these Engineering Challenges. Each set comes with all the materials required. In the Propellers Set, you will be building a chopper, a plane, a biplane, and a windmill. All the parts required to build them are already provided. Once you’re done with the builds, does it end there? Of course not. You can use the parts again and again, and continue surprising yourself with the various unique builds that you can come up with on your own! In the future, we would like to see more Construction Sets aside from the three that are already available. This will give us more options to choose from. ThinkFun guarantees customer satisfaction on its construction sets. However, they have a 30-day return policy for products with defects. Are The ThinkFun Maker Studio Construction Sets Worth The Money? Engaging children’s interest in science and engineering can be quite a challenge, and anything that helps in accomplishing this is certainly worth spending on. Where Can I Buy The ThinkFun Maker Studio Construction Sets? 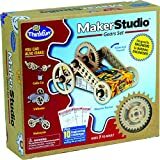 You can get the Maker Studio Construction Sets directly from ThinkFun or any of its authorized retailers and resellers. But you may also shop online since there are many stores that will sell it. 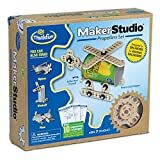 Amazon is one of the safest places to order your Maker Studio set. They also offer competitive pricing on products and will even let you buy them with Free Shipping! Your budding engineers need just the right tool to get started on their road to become builders, and nothing fits the bill more than the Maker Studio Construction Sets from ThinkFun.